Also available in Blu-ray, this two DVD set is a celebration of The Israel Philharmonic Orchestra’s 75th anniversary in a concert at the huge Hangar 11 venue in Tel Aviv. This was one of a series of concerts in December 2011, which included soloists such as Gil Shaham, Murray Perahia and Pinchas Zukerman, and by all accounts was something of a showcase for this very fine orchestra. Conducted in stylish form by the orchestra’s musical director for life Zubin Mehta, the concert is superbly recorded, though the limited number of views means the music is somewhat more important than the imagery on the whole. The close-ups of Vadim Repin swooping around in the Chausson Poème get a bit much after a very short time, but in general the concertos are nicely filmed, with plenty of Evgeny Kissin’s expressive visage and hands busily at work in the Chopin. The Beethoven Eighth Symphony allows us more decent shots of the distinguished members of this orchestra, though even this has its limits. If I was to sum up this concert the words ‘refined’ and ‘genteel’ spring to mind. Mehta doesn’t go in for exciting tempi or blistering excitement in Beethoven’s Eighth Symphony, and while the playing is very admirable indeed there isn’t a huge amount making this performance inexpressibly special. The highlights for me are Julian Rachlin’s Saint-Saëns Introduction et Rondo Capriccioso, which manages to be soulful and witty at the same time, and his admirable Bach Sarabande, which he plays in an intimate and unshowy way, both an antithesis and the moving essence of such an event. Chopin’s Piano Concerto No. 1 is full of beautiful moments in this performance, the Israel Philharmonic’s marvellous string sound a clothesline from which the soloists dramas and subtleties can move with elegance and a sense of nostalgic reflectiveness. Kissin’s solo, the Scherzo No. 2 is perhaps the most exciting musical event on stage in this programme, a typically unrestrained pianistic display of fireworks and excellent musicianship. You may not like the visual results of the Chausson and the orchestra sounds least comfortable with this work out of the whole selection, but there is no doubting Vadim Repin’s tone is perfect for the piece. What is captured well is the orchestra’s warm depth of sound, and you take away from these performances is plenty of ‘soul’, an indefinable expressive presence which might be ascribed to these musicians in stereotypical terms, but which in this case makes for a collective experience which makes you hear familiar works in new ways. János Darvas’s documentary film, ‘Coming Home’ is much more than just a bonus disc, with perspectives on the Israel Philharmonic’s history and traditions, including comments from Leonard Bernstein, Zubin Mehta, Daniel Barenboim, Isaac Stern, Pinchas Zukerman and many others. There are remarkable historical clips of legendary musicians such as Rubenstein, and reminiscences of Toscanini and others, but more importantly we have a glimpse of the lives and diverse family backgrounds of some of the musicians and a clear idea of how their spirit and passion for music creates such a marvellous band. 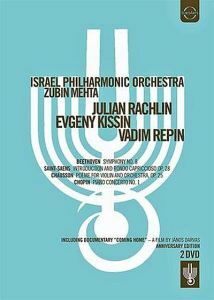 There is no escaping the political problems in the region in which this orchestra exists, and the documentary takes the place of the orchestra during the conflicts of the mid-20th century in its one-sided stride, including the six-day war, though this aspect of the situation in Israel is by no means a point of focus. The orchestra was originally founded as the Palestine Orchestra, and such an organisation cannot have existed in such a land without plenty of change and no shortage of turbulence. The scenes of protest as Mehta attempts to perform Wagner in 1981 are remarkable, but as Barenboim points out, the European character the orchestra had after World War II has been maintained, and is indeed in no short measure due to the caring curatorship of Zubin Mehta. I can imagine people not wanting to celebrate 75 years of the Israel Philharmonic Orchestra, but if you can’t separate politicians from musicians then you do a great disservice to the latter. If you want to find out about one of the finest bunch of musicians on the planet this is as good a place as any to make their acquaintance.